There are ecovillage open days in Ireland, Italy, Slovenia, Spain and Sweden, a lecture on rural eco-tourism in Serbia and conversations about Transition in Spain. In Poland leaders of social change will gather to share their experience of techniques and methods for alternative education, in Wales there’s a 30th anniversary celebration of a wildlife conservation farm and in Northern Ireland there’s a gathering to inspire woodland social enterprises in a community-owned wood. In Germany there’s a bike tour and a food fermentation workshop, in Luxembourg the launch of a community garden and throughout France and Belgium there are some 1500 events as part of La Fête des Possibles. In the Netherlands people are exploring simple actions for social and ecological well-being, in Portugal there’s a gathering in the permaculture garden at Lisbon university and in Croatia there’s an international co-creative gathering for transformational learning. At a conference co-hosted with the EESC in Brussels on Friday 22nd (webstreamed here) ECOLISE representatives will showcase for policy makers and other stakeholders the huge diversity of ways that local communities, such as those celebrating the European Day, are taking action on critical global challenges, driven by the desire of ordinary people, throughout Europe and the world, to be part of the solution rather than the problem. 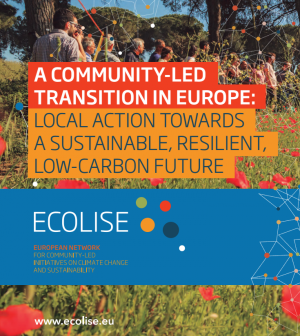 A booklet – ‘A community-led transition in Europe: Local action towards a sustainable, resilient, low-carbon future‘ – which gives a snapshot of these community-led initiatives, will be officially launched at the conference. The results are impressive, not just in terms of the scale of the mobilisation (now counting some 15,000 ecovillages worldwide, over three million permaculture practioners, and around 1,200 Transition initiatives) but also the positive environmental impacts: studies of CO2 emissions in Danish ecovillages, for example, find they are 60 per cent lower than the national average, while Findhorn ecovillage in Scotland has the lowest documented ecological footprint of any settlement in the industrial world. Transition initiatives are also achieving impressive results. The Transition Streets project in Totnes, England, involves 468 households, each saving at least 1.3 tonnes of carbon annually. Just as significant as the direct carbon savings, however, are the wider environmental impacts, the awareness raising, the social cohesion, the creation of local livelihoods and retention of wealth in local economies and the feeling of empowerment that citizens experience by working together to bring about change. Community-led initiatives on climate change and sustainability are helping to mobilise citizens, change mind-sets and behaviour, and catalyse decentralised solutions based on social and technological innovations. However, these bottom-up approaches need a policy framework that enables action and fosters the spreading of such initiatives.